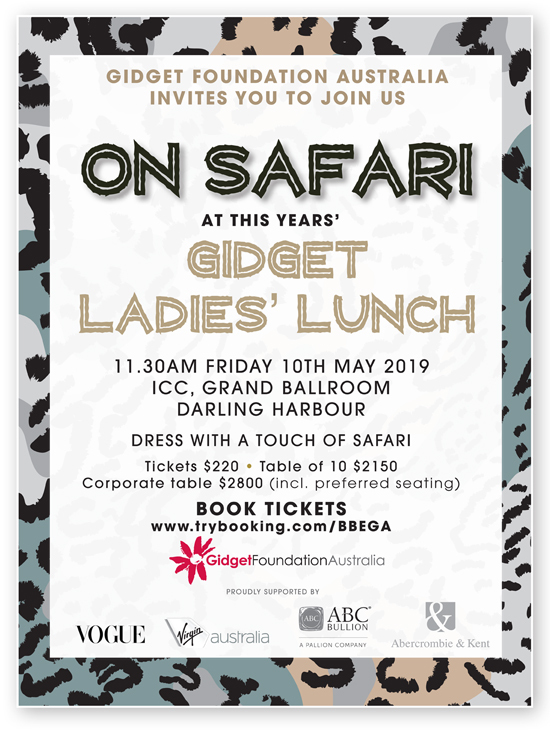 Gidget Foundation Australia’s marquee event is the annual Gidget Ladies’ Lunch. A fully subscribed event consisting of around 1,500 people from our community of supporters, it traditionally sells out in one day. Held each year close to Mother’s Day, the event is the Gidget Foundation’s major fundraiser. In partnership with Vogue Australia, this is an event to rally all your gals together for a wonderful day out! Gidget Foundation Australia is a not for profit organisation that provides programs to support the emotional wellbeing of expectant and new parents. Nearly 1 in 5 mothers and 1 in 10 fathers will experience perinatal depression and anxiety that is often hidden and not fully understood. It impacts around 100,000 Australians each year, and parents experience adjustment disorders. Your attendance at events like this as so important to us. Not only does it raise vital funds to allow us to continue to support those who need us most, it also helps us work towards ending the silence and stigma around mental health, in particular, perinatal depression and anxiety.